The global market for monoclonal antibody therapeutics is expected to witness a high level of competition in the next few years, thanks to the rising number of players entering the market, states a research study by Transparency Market Research. A substantial rise in the number of collaborations between small companies with the leading players is estimated to encourage the growth of the market in the forecast period. This is expected to help the prominent players in the market in reducing the high cost required for the research and development activities and production processes. Some of the players, namely Pfizer Inc., Bayer AG, Sanofi, Merck & Co., Inc., GlaxoSmithKline Plc., F. Hoffmann-La Roche Ltd., Novartis AG, and AbbVie Inc. are projected to lead the global monoclonal antibody therapeutics market throughout the forecast period. 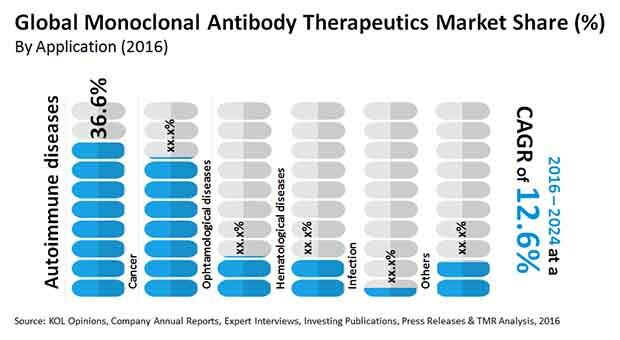 According to the research report by Transparency Market Research, in 2015, the global market for monoclonal antibody therapeutics was worth US$86.7 bn. The market is estimated to reach a value of US$245.8 bn by the end of 2024, exhibiting a progressive 12.60% CAGR between 2016 and 2024. From a geographical point of view, the North America market for monoclonal antibody therapeutics is anticipated to witness a healthy growth and account for a key share of the market in the near future. North America is projected to be followed by Europe. The rapid growth of these two regions can be attributed to the rising geriatric population and the rising number of favorable reimbursement policies. In addition, the rising awareness among consumers regarding the availability of drugs and therapeutics in order to cure diseases and the affordable healthcare services are some of the other important factors that are likely to accelerate the growth of the market in the next few years. Furthermore, Asia Pacific is projected to witness a steady growth in the coming years. In terms of application, the autoimmune diseases segment is likely to account for a key share of the global monoclonal antibody therapeutics market throughout the forecast period. The rising investments in research and development activities and the growing awareness among consumers related to the rising cases of autoimmune diseases are expected to encourage the growth of this segment in the next few years. In addition, the expansion of the monoclonal antibody therapeutics is another factor projected to accelerate the development of the market in the coming years. The rising number of cases of chronic diseases, including cancer is expected to encourage the growth of the global monoclonal antibody therapeutics market in the next few years. In addition, the increasing health concerns and the growing diagnoses of cancer cases in different stages are projected to supplement the growth of the overall market in the near future. Technological advancements in the healthcare services and the expansion of the product portfolio are estimated to contribute substantially towards the development of the market in the forecast period. On the flip side, the global market for monoclonal antibody therapeutics is projected to face several barriers, due to which the market is likely to restrict the growth of the market in the next few years. The rising production and popularity of biosimilars for the treatment of several chronic disorders and autoimmune diseases are estimated to hamper the development of the global market in the coming years. In addition, the rising concerns related to the patent expiry are predicted to restrict the overall development of the market. Nevertheless, the increasing level of competition and the rising product portfolio are estimated to offer promising growth opportunities in the next few years.